This insect repellent Kinven Mosquito Patch protects you and your child from those pesky biting insects! Repels mosquitoes, flies, gnats, no-see-ums and fleas. Don’t like bites? Do what’s right! Protect the whole family with a naturally formulated, no DEET insect repellant. Get the Original Kinven Anti-Mosquito Patch! No need to spend on bug zappers, repellent traps, or insect repellent wipes. It contains a chemical-free formula that is safe for children and pregnant women. ALL-NATURAL NON-ALLERGIC INGREDIENTS: The Kinven Mosquito repellent patch is made with non-toxic ingredients that is purely safe for direct skin contact use. Especially formulated to give harmless results with a touch of aroma! 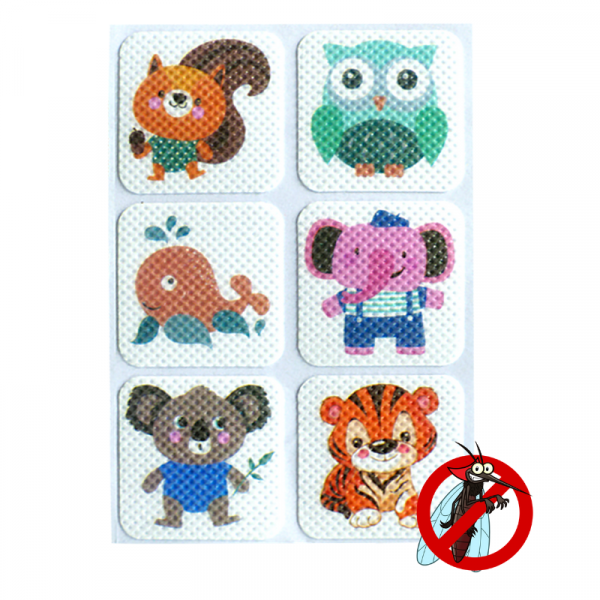 ECO AND CHILD-FRIENDLY: Kinven’s mosquito repellent patch is made with Kids safety and attention as a priority and with that we have decided to pick 6 gorgeous animal designs to match their mood! It’s eye-catching for your kids but a problem for the mosquitoes! NON-SPILL AND NON-MESSY: Kinven’s mosquito repellent patch can be brought to wherever you go minus the hassle of liquid spilling over and causing more headache than peace of mind. It is also easy to use and will stay in place despite your activities so you’d stay fresh and neat! PATCH IT ANYWHERE: Enjoy all those outdoor activities uninterrupted. The Kinven mosquito repellent patch will be your family’s new member of the family with only one purpose, keep those mosquitoes which are not part of the fun away! WE’RE HERE FOR YOU: This rarely happens but if there is ever a time when your Kinven mosquito repellent patch performs underwhelmingly than you have expected, we have kept that in mind and you are free to reach us any-day, anytime to help you get that satisfaction back to a 100!